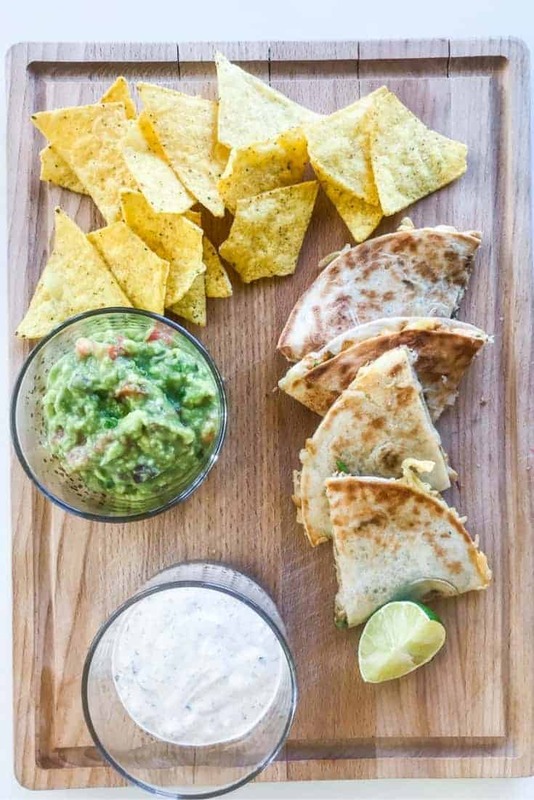 These tasty chicken quesadillas with guacamole and ranch dip are quick and easy to make thanks to the store-bought grilled chicken, and perfect for both a dinner or a snack (or both at the same time!). 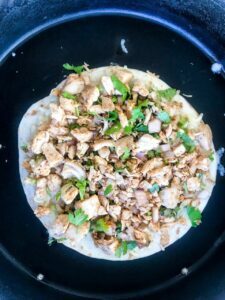 If you’re following my recommendation and making the guacamole and ranch dip for your chicken quesadillas from scratch, you’ll still spend no more than 25-30 minutes in the kitchen. 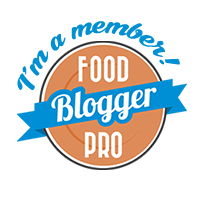 (And it will be well worth your time – these sauces are the bomb!) If you want to you can make the sauces ahead of time and let them sit in the fridge, they really love that. 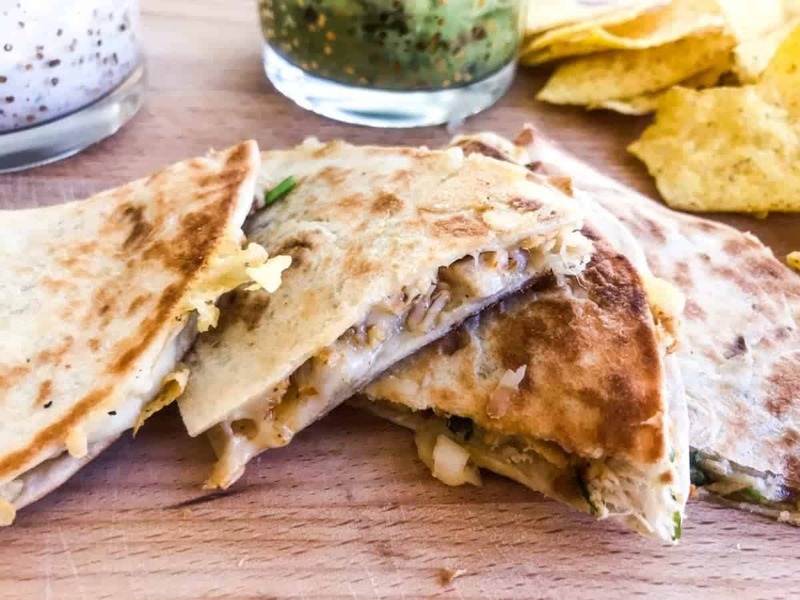 However, if you wanna save time and are OK with going the storebought route, it will take just 15 minutes to make these chicken quesadillas for 4 people. Either way, it’s quick, easy and delicious (and feels like eating a snack for dinner!). To be honest, even if you make the sauces from scratch, we’re cheating our way through this recipe. Remember how I said I love a good cheat? Like for my Salmon Spinach Pasta? Well, here’s one of my all-time favorites: store-bought grilled chicken. I love eating it as it is, or with a simple tomato-avocado (maybe throw in some feta cheese as well) salad, or with fries & ketchup for that matter (sounds gross but it’s SO good). And, I love cooking with it, it makes everything so much quicker. 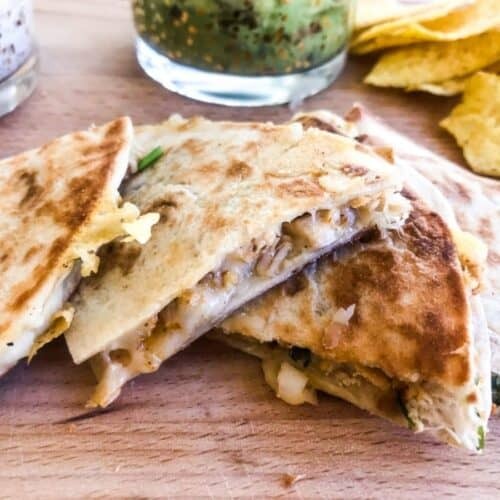 Storebought or not (you are of course allowed to use home-grilled chicken or chicken cooked in some other fashion as well), what makes the chicken for these chicken quesadillas absolutely delicious is a bit of magic called “mom’s cooking secrets”. More specifically, the magic of mom’s chicken enchilada filling. I like a good enchilada, but I don’t really see the point off it, you know? To me, a taco or quesadilla is so much better. But! Mom’s chicken enchilada filling is divine. And very well suited to be placed inside a chicken quesadilla. There’s shallots, cumin, chili, cayenne, some salt and pepper, and a serious helping of cilantro – and that’s about it. Nothing else needed, in my opinion. 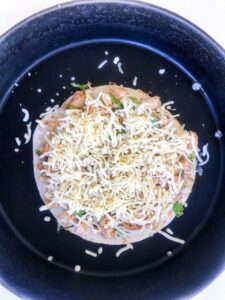 Once you have your sauces and the chicken filling done, cooking the chicken quesadillas is really quick and easy. 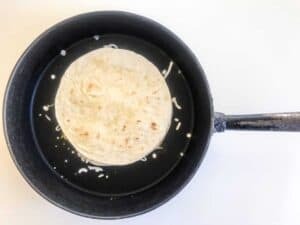 Start by placing a tortilla bread in a pan over medium-high heat. 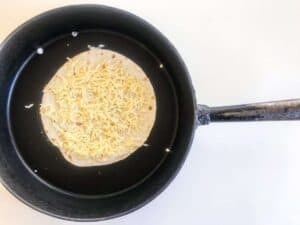 Add a generous amount of cheese (try not to get too much in the pan…). Then add the chicken filling (generously, of course!). Finally, top with another tortilla bread. And cook until it has a nice, golden color and the bottom layer of cheese has melted somewhat. This takes about 1-2 minutes. Then comes the only hard part of this recipe – flipping it. It’s OK if you mess up. Just try your best. 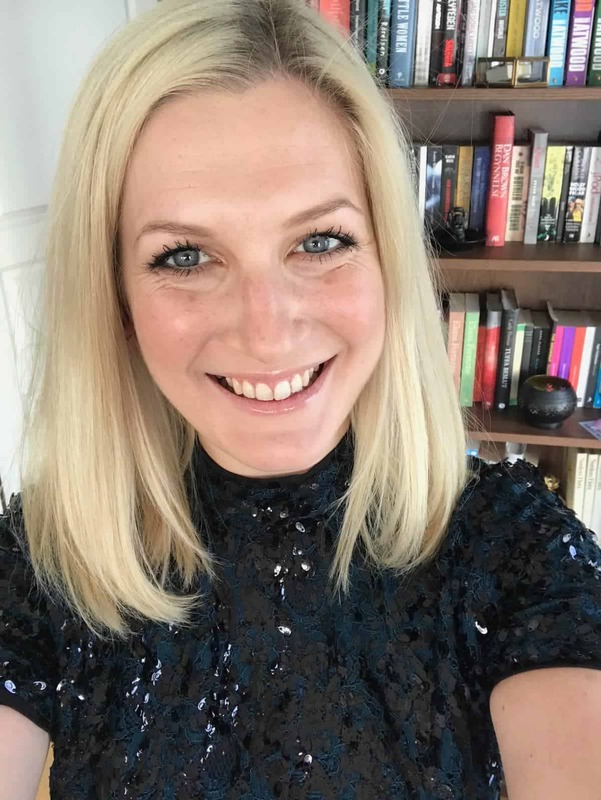 Happy I haven’t started with video (yet!) as my flipping skills need a bit of practice. Finish cooking on the other side and – ta-da! Done. Serve with your sauces (you may add more sauces if you like! Let me know if you find any other ones that go well with it and I’ll try it out. 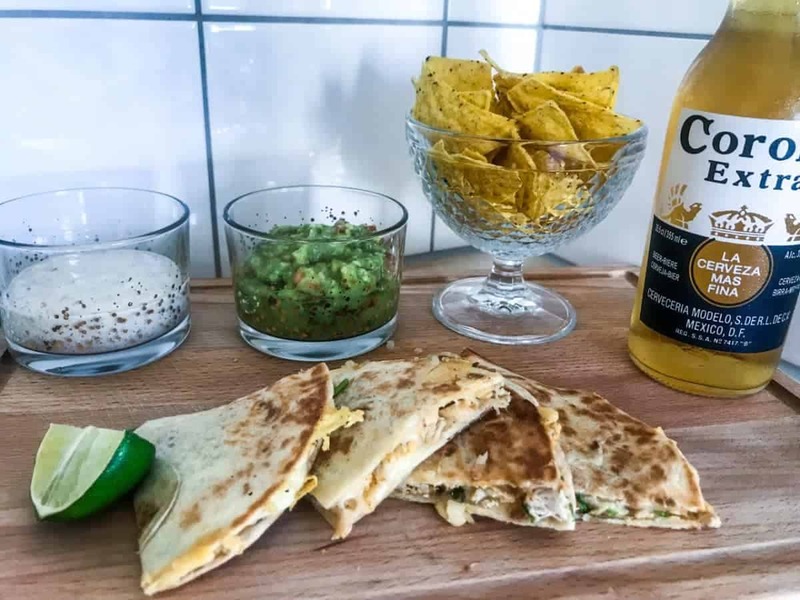 ), tortilla chips, lime slices because it’s pretty (can be omitted if you’re not a food blogger, they serve absolutely no purpose in this recipe other than being pretty) and don’t forget that cold Corona. Combine the minced garlic and salt in a bowl and mash together. Add the rest of the ingredients and mix. Taste and adjust according to taste. Place in the fridge until you want to serve it - it's best after a few hours in the fridge but OK straight away as well. Optional: soak the onion in water for about 15 minutes to take some of the edge off. Combine the minced garlic and salt in a bowl and mash together. Add the avocados and mash them. Add the rest of the ingredients and mix. Taste and adjust according to taste. Combine the chopped chicken, shallots, cumin, paprika powder, chili powder and cayenne powder in a bowl and mix together. Mix in the chopped cilantro. Taste, add some salt and pepper and adjust seasoning as needed. 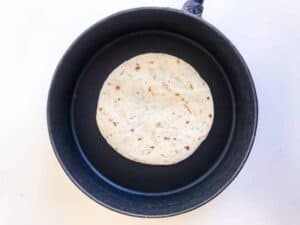 Heat a dry pan over medium-high heat and place a tortilla bread in it. Add 1/8 of the cheese followed by 1/4 of the chicken and another 1/8 of the cheese. Top with another tortilla bread. 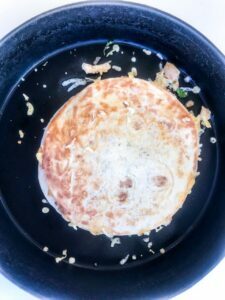 Cook until the bottom tortilla is golden brown and the bottom layer of cheese has started to melt, about 1-2 minutes. Flip, and finish cooking on the other side, about another 1-2 minutes. Repeat to make four quesadillas (or as many as you like). Slice the finished tortillas in four pieces each and serve with the ranch dip, guacamole and (if you like) a handful of tortilla chips. 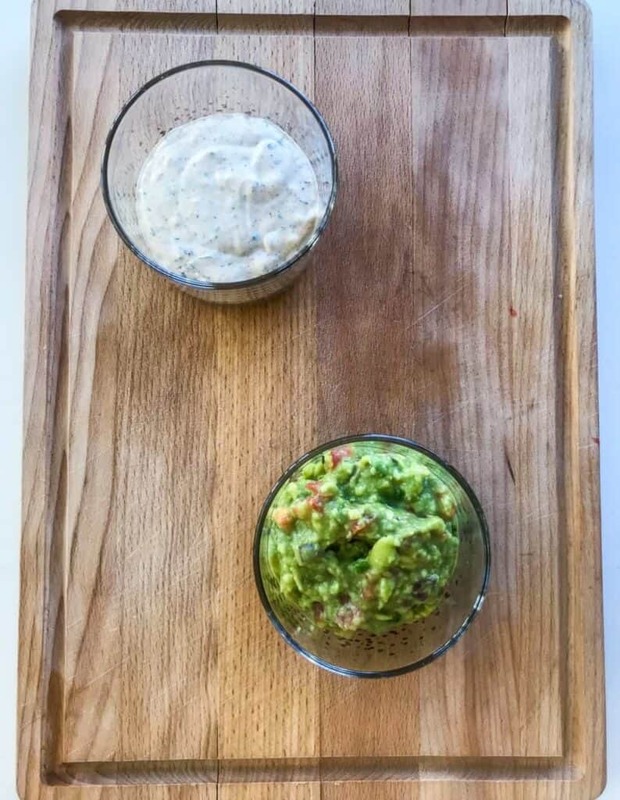 I know guacamole is usually said to be served straight away - but I really like it better when it's been sitting for a while. So making it ahead of time is perfectly fine (and preferred, if you ask me). Soaking the onion in cold water before adding it to the guacamole takes a bit of the sharp onion edge off but leaves the nice onion taste - I like to do it, but it works without as well. I usually just make this for myself but make the whole 4 people-recipe, cook one quesadilla and put the leftovers in the fridge. And then I have it for dinner for 4 days - doesn't get a lot better than that. Cheese is a favorite of mine. 250g is a lot of cheese. Use less if you're not as big a fan.